I hope everyone is having as good a week as I am! feels good to know that things are improving! Anyhoo, on to why I'm here! 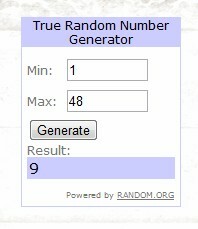 My Blogoversary Candy is now closed & it's time to announce the winner! as I didn't know who had entered until after he had chosen! Can you email me your snail mail addy & I'll get your prize off to you! the lovely comments you leave for me! Blogging wouldn't be the same without you! I've decided to run another mini candy for you all!